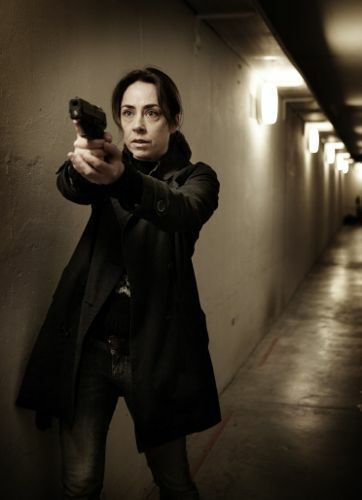 Sofie Grabol as Sarah Lund in The Killing III. This is the “pre-jumper” jumper. The last case for Sarah Lund. There were a few gasps of surprise from the audience at the British Film Institute in London last Friday (Nov 9) night when “the third and final series of The Killing” was introduced. Which just goes to show not everyone keeps up with the news. We have, of course, known for a long time now that Denmark’s compelling television export would be no more after the end of series three. 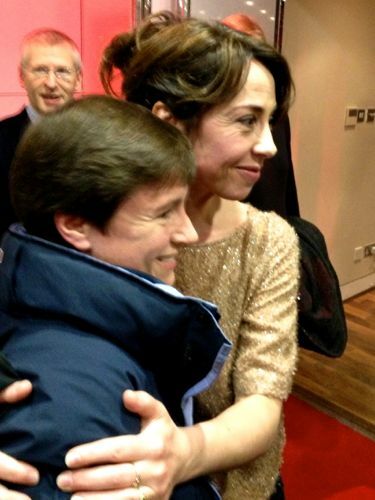 It was confirmed when Sofie Grabol appeared at BAFTA in London this time last year. Click here to read my transcript of that November 2011 Q&A. But it’s still hard to come to terms with the fact that there are just 10 more episodes of this BAFTA award-winning production left. My full transcript of Friday’s fascinating BFI Q&A is below. 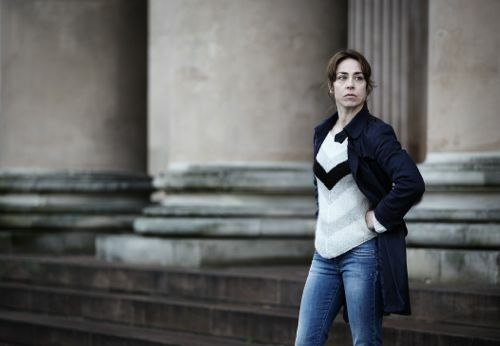 Chaired by Ben Preston, the editor of Radio Times, it featured Sofie Grabol, who plays Sarah Lund, creator, writer and showrunner Soren Sveistrup and producer Piv Bernth, who is now also Head of Drama at the Danish Broadcasting Corporation. As ever, their English puts me to shame – and you’ll have to watch out in the transcript for Soren’s very dry sense of humour. The Q&A session followed a preview screening of episode one, introduced by the Danish Ambassador to the United Kingdom, Anne Hedensted Steffensen. Perhaps just as well that I’d already seen it, as well as episode two, as the lady’s head in front of me mostly obscured the English subtitles. I’ve since watched episodes three and four and am, of course, now desperate to see the rest. The Killing III begins on BBC4 at 9pm next Saturday (Nov 17), starting a run of double episodes over the next five weeks. 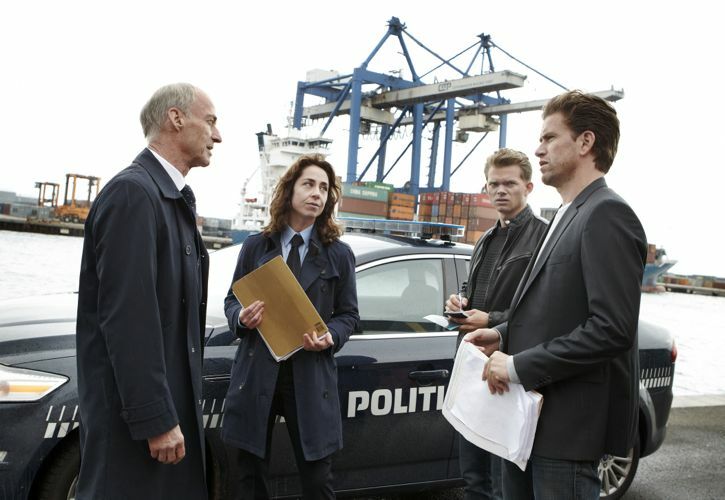 With episode eight screened in Denmark tonight (Sunday Nov 11) and the tenth and final episode still being edited. You will only find the very mildest of spoilers below. It’s not giving too much away to say that a distracted Detective Chief Inspector Sarah Lund does not have her mind fully on the job when we meet her again. She is trying to look after herself for a change, having applied for a job away from the police front line with the OPA – Operative, Planning and Analysis – department. Also hoping to build broken bridges with her now grown up son. As you can see from the photo at the top of this page, there is a pre-jumper, jumper before we meet the real new deal in episode four. Sarah also appears in her police dress uniform, complete with tie – worn for an anniversary ceremony marking her – and others – 25 years of police service. You’ll find a photo of Lund in that uniform further down this page. Soren has set the story of Forbrydelsen III against the backdrop of the global financial crisis and its domestic impact in Denmark. With the Prime Minister involved in a bitter election campaign. There is, of course, a killer. But with a twist. Soren warned us not to risk our money betting on the identity of the murderer. “We changed the story because we wanted to do something different,” he said. This time around viewers are also, of course, desperate to know how Sarah Lund’s own story will end. Copenhagen and surrounds still appear to have an acute shortage of mains electricity. Leading to plenty of renewed use for police issue torches in dark and scary places, including a nod to the woods in series one. While the opening scenes on the old freight ship Medea will have you gripped from the very start. 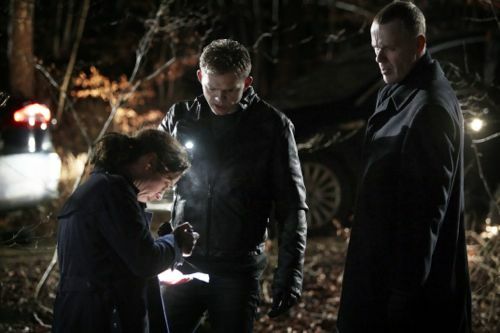 The Killing’s soundtrack is again hard wired to the hairs on the back of your neck. Not least in the four episode ending cliffhangers I’ve seen so far, which absolutely demand that you watch the next hour immediately. There’s a scene in episode three where some of the characters speak in English, which is a bit of a strange experience. And the Danish Ambassador teased us that “we will see more” of Sarah in this series”, with speculation that the jumper may come off at some point. 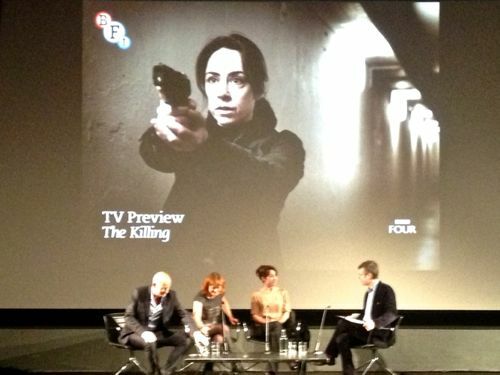 It’s generally accepted that while The Killing series two was excellent, it did not match the 20 episode first series. How could it? That classic first year will probably not be surpassed. But from what I’ve watched so far, this finale aims to give it a very good run for its money. The transcript is quite long but well worth reading in full. Highlights include Sofie recalling how she filmed Sarah Lund’s final three key scenes on her very last day on set. And how ending her role as Lund suddenly “hit me like a hammer” once she stopped work. Sofie also reflected on the visit of Prince Charles and Camilla, Duchess of Cornwall, to one of the locations during filming for this series. Without, of course, revealing what they were, Soren spoke about the options for Sarah Lund’s end story. “It’s been a great party, this The Killing party. We had great fun and it’s been very, very hard. But we agreed from the start that it wasn’t going to be a never-ending story. Soren, Piv and Sofie told us how the pressures of the “crazy pace” of filming and last minute delivery of scripts were part of what made The Killing such a success. Along with relationships built up by those working on the drama for several years. While Soren summed up how he viewed The Killing. Piv, Soren and Sofie spoke about the courage to end The Killing when it was still a huge success and avoid being one of those drama series that goes on for far too long with a subsequent drop in quality. “Really I think that so much television stinks,” Soren told us. On stage at the BFI in London. 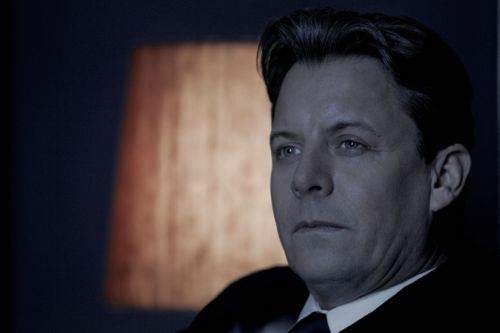 Q: (Ben Preston in the chair) Sofie – that’s a very different Sarah Lund in the first episode…what’s ahead in this series? Q: Sarah is not quite focused on work at the start of this series? Q: Lots of important details, which sounded like you talked for hours, days, weeks, months before you started about where this series three should begin? Q: And with every series the canvas gets larger. 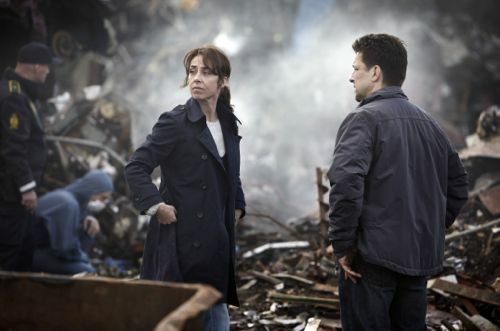 Series one was Copenhagen, it was mayoral politics. Series two was Afghanistan, a conspiracy in the Ministry of Justice. And in series three, here we are the financial crisis, globalised capitalism, a prime minister…you love grappling with politics? Q: And you’re looking also at how business has responded to the downturn? Sigurd Holmen le Dous as Sarah Lund’s new police partner Asbjorn Juncker. And as as we know, that always goes well. Q: We always follow Danish politics. And we thought Cameron and Clegg meeting in The Rose Garden was good enough. But you have a Centre Party having a secret affair on the election trail? Q: Piv, you presumably were very keen to get a bit more about Sarah’s hinterland. We’ve not known much about Sarah in the first two series, her personal side. And then suddenly this comes very much to the fore here. We’ve had on the authority of the Danish Ambassador that we may be seeing more of Sophie? Q: Who needs a cellar when you’ve got the hull of a ship? Q: When did you tell Sofie which of the options…? Q: Sofie, you’ve lived with Sarah for eight years. How did you prepare for the last day of shooting? Q: Did you keep the jumper? Q: We’ll come back to the jumper. Q: I tweeted out last night and said, ‘You might have some questions.’ And so I got a lot of questions. But before we come to the jumpers, of which there are many…the first came from someone called @gwizardry who said, ‘Is there any way possible we can get a fourth series agreed. We can use UK taxes if necessary?’ Is it really the end? Is there a glimmer of a crack open for a return? Q: But that’s something that you came into this whole process thinking? Q: Because when you pitched the original story to DR (who make The Killing) you didn’t even tell them it was a police procedural, did you? 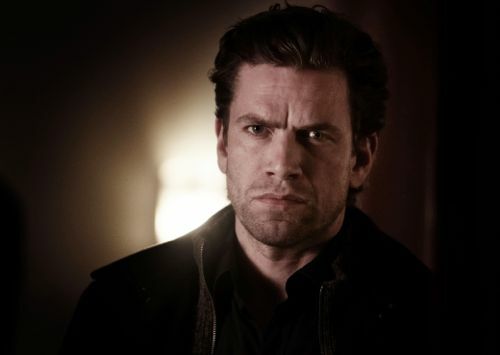 Nikolaj Lie Kaas plays Special Branch’s Matthias Borch, who is also a police partner of sorts for Lund and knows her from younger days. Q: Piv, you’re now in control of Danish drama, which is, Krona for Krona, probably the world’s biggest drama hit factory around – The Killing, Borgen, The Bridge and so on. What principles are you trying to take from The Killing and push out into other projects? What are the principles that make Danish drama so astonishingly successful at the moment? Q: Because the success of the show has been absolutely astonishing. Camilla coming for an on set visit? You didn’t think that when you started out? What did she say to you? Q: Because in Denmark you’re getting 65 per cent of the total amount of audience…are watching The Killing at the moment, which is just astonishing figures. And it means that everyone wants to know what’s happening. Your (Sofie) children are trying to find out what happens at the end of this series? 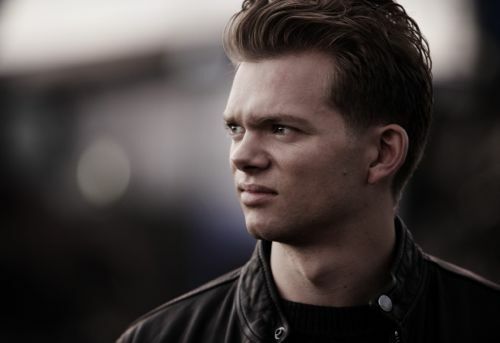 Anders W Berthelsen as shipping boss Robert Zeuthen. Ben Preston then opened the session up for questions from the audience. Q: For us as a British TV audience, the idea of a 10-part series…a 20-part series of The Killing part one, is just inconceivable. The most we can every manage is four or five episodes. But with The Bridge, Borgen and this – is it a long established principle that you can make such long series? Do you have to fight for the money? Do you have to argue for the benefit of having such a long series? Or is it a given with you? Q: (From me, as it happens): Sofie – can I ask you to recall how you felt when you first received and read the final script for the very last episode and also did you agree with the decision, whenever that was made, as to where Sarah ends up at the conclusion of the series? Helle Fagralid plays Maja Zeuthen. Q: I just wanted to ask Sofie which was her favourite storyline out of the three to film and why? Which series was your favourite? Which story? Q: (Ben Preston) Soren, which one are you proudest of? Q: Sofie – how hard an act will this be for you to follow because of the success and the way that everyone has taken it to heart? And how much will you miss playing Sarah? Q: There’s a lot said here about the kind of Scandinavian crime tradition. There’s even a Radio 4 series all about it at the moment. I just wondered to what extent you felt that you were part of any kind of Scandinavian crime tradition? And what influences from that sort of genre might you feel or might have experienced? “There’s a store selling AA batteries about a mile from here.” Lund, Juncker and the always highly-charged Lennart Brix (Morten Suurballe). Q: The second series has prompted this question. In the middle of the last decade there was a film in English, translated as Brothers about the Danish experience of the Afghan war. There’s been the very powerful documentary in Denmark, Armadillo. And the second series, obviously, an absolutely essential part of the background to the plot was the crazed conspiracy involving a cover-up, apparently, of murders of civilians by a Danish soldier. What impact has the war in Afghanistan had on Danish popular culture? Because it seems quite extraordinary to me that you have at least three quite significant works that have been broadcast widely in Britain and internationally, clearly influenced by the Afghan war. Is it in a sense Denmark’s cultural equivalent of Vietnam for the United States in the late sixties, early seventies? Q: Sofie – I immensely enjoyed your cameo in Absolutely Fabulous. Will we see you do any more comedy on these shores…in the UK? Q: (Ben Preston) So we’re going to see some drama with strong men at home? Robert Zeuthen and his two children, Carsten and Emilie. Posted in News and tagged Absolutely Fabulous, Anders W Berthelsen, Asbjorn Juncker, BBC4, Ben Preston, BFI, Borgen, British Film Institute, Denmark Radio, Denmark. Copenhagen, DR, Helle Fagralid, Lennart Brix, Maja Zeuthen, Matthias Borch, Morten Suurballe, Nikolaj Lie Kaas, Piv Bernth, Radio Times, Robert Zeuthen, Sigurd Holmen le Dous, Sofie Grabol, Soren Sveistrup, The Killing 3, The Killing III. Bookmark the permalink. Thanks for the transcript – I was there but knackered and didn’t take it all in. After months of hard graft, I finally got to meet her! You can read the interview on Diva’s website. She’s lovely.